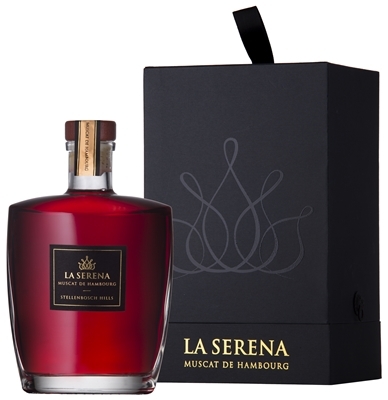 La Serena is crafted from one of South Africa’s rarest grape varieties, Muscat de Hambourg, La Serena, pays tribute to the rich history and heritage of Stellenbosch Hills. Only 1400 bottles of this sensual aperitif were produced, making it the perfect gift or collector’s item. La Serena, meaning “serenity” or “being serene, calm or tranquil” is the brainchild of the innovative Stellenbosch Hills team, under the direction of cellar master PG Slabbert. Made from Muscat de Hambourg grapes from the La Serena farm of Viljee Carinus, a founding member of the cellar.